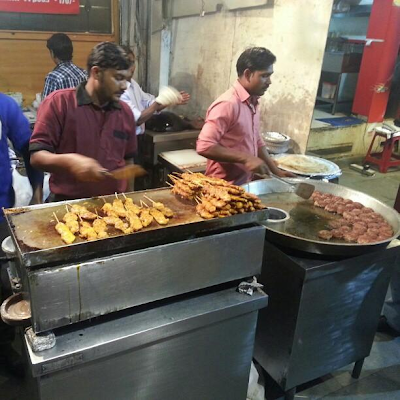 They say that the true mark of a “Dilli Wallah” is how he loves his street food… And rightly so! Be it the noted gol-gappe and aloo-ki-tikki wala in every single locality of our city, or the ubiquitous momos wala, we love our street food! But time and again there has been that one road side food joint which stood tall and made its mark well above the others. 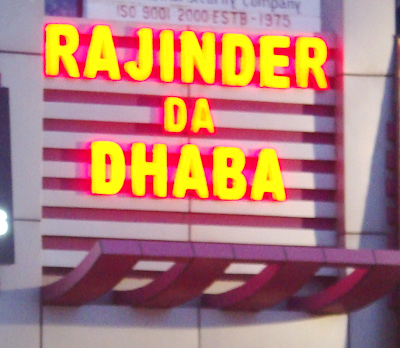 Setting the mood just right on that note, for our latest restaurant review at Foodathon, we present to you a glutton’s guide to mouth-watering-non-vegetarian-delight at Rajinder da dhaba. Niched away in the shadowy reaches of an otherwise busy green-park market, this restaurant is located at the erstwhile Kamal cinema complex (as commonly known to most of the people in the surrounding area). Though the restaurant has an authorised MCD car parking right in front of it, the odds of getting a slot in the peak evening hours are low. You might want to wait on the main road, sitting inside your car while waiting for a parking slot, or you could park it inconspicuously, a tad bit further down the road, away from the attention of the local police wallah who’d be rather busy earning his daily fortune(in ways beyond the scope of this review) near the dhaba. Once you get to the place, and supposing that you choose the peak evening hours, you would find it a little confusing at the first sight to figure out whom to catch hold of to get you a menu card. But you don’t have to worry. Amidst a whole lot of people eating at make-shift tables scattered randomly, or inside/atop their own or someone else’s car, you’ll soon find one of the saviours named “chotu” - wandering aimlessly, giving you the “I’m approachable” look! This person that you see in a peculiar dress code (followed nationwide in almost all urban and rural dhabas - a torn shirt and shorts), is actually the waiter. Apparently, chotu never grew up, and though he seemed a little older and taller than most of us, we stayed focussed on reviewing the restaurant, more than the strange naming convention. Legend has it (or maybe not), that whenever a bemused broiler is sacrificed at Rajinder’s, there’s always been a good recipe and a grinning foodie ready to set those taste buds on fire. This place certainly uses every single spice available at the disposal of mankind – and it uses ‘em well! The curries, served piping hot, are rich in both aroma and taste. And though, a few of the menu items weren’t really meant for the faint-hearted like me, the spicy treat was well savoured by others in the group. Chicken curry, for one, seemed to contain more chillies than what I would have consumed in my entire life span – but that’s just me. Among the dry items were the mouth-watering afgani chicken, chicken burra (often confused with burraaahhh? - used effectively in a few peppy Punjabi songs out there), mutton-galauti-kebabs, along with my favourite item on the menu – chicken satay, which caught our attention. This ever so delicious item is the one to die for. Curry items like butter chicken and chicken curry definitely go well with garma-garam butter or garlic naan, or even rice. All that said, things did go a little downhill with the veg items like mushroom tikka, but then again this place is largely about its non-veg food and so is this review. An easy choice for vegetarians in the group was shahi paneer with garlic-naan, along with a side order of paneer tikka. The paneer tasted well cooked and fresh, however the gravy seemed common between the chicken and paneer butter-curry variants. Gravy and salad seemed to be on-the-house for everyone. I think these people own an onion farm or something, because you could simply yell out for it, undirected to any specific person, and out of thin air appears chotu with fresh sliced onions in a disposable plate. They don’t even verify if you’re actually a customer or just came by for free salad. 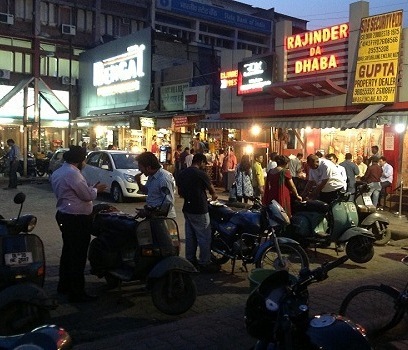 Assuming that you happen to choose to savour the food in the open setup, right in front of the dhaba, you might want to keep away from the fiery items on the menu. Why, you might ask? Come on, this place is a family restaurant! You don’t want to be the fire-belching dragon in front of a two year old, now do you? Another reason being, that you might not want to get into the mess of spilling gravy, served in disposable plates, all over your clothes. However, if you do have to try them out, butter chicken with rumali-rotis/garlic-naan would be our recommended combo on the list. This place surely wins our respect for its dry items. If you don’t mind the extra cholesterol, then mutton galauti kebabs and chicken satay are a must have. Every bite leaves you wondering about the tenderness and the freshness of either item. Mutton seekh kebabs win the next spot in our highly recommended items list, where afgani chicken follows next. This place does have a lot of other items which we did not get a chance to try (due to space constraint issues in our stomachs), but they certainly looked yum! In case you do happen to try them out, please don’t forget to add about them in the comments section below. Despite a couple of dud choices on the menu, the food is much better than it needs to be at what is obviously a road side dhaba. The food is certainly fresh and well cooked. This place, if not rated for its ambience and surroundings, easily deserves a top spot in ‘not-have-to-think-twice’ list of any non-vegetarian. Thankfully, this place is not over priced either! You could drive, walk, or hitchhike up to it any single day of the year and not have to worry about having made a bad choice. The starters certainly go well with alcohol. And we know that you know, how to act responsibly, and so we’re not going to lecture you on that. This place does offer free home delivery, so you could either call in or simply drop by and have the order wrapped up for a party back home. Hey Dimple, I really liked your review for being very well described covering all the aspects. Well done! I totally agree that the food is on fire at times, but again "delhi wallas love spicy". I tried the mutton kebabs but will try the chicken satay as you recommend. Cheers to good food!